El Salar de Uyuni, el desierto de sal más grande del Mundo! ¿Cuándo es el mejor momento para visitar el Salar de Uyuni? The tour takes place in the Madidi National Park located in the Northwest region of La Paz department. The Madidi National Park is in the provinces Franz Tamayo, Iturralde and Abel Bautista Saavedra in the uper Amazon River basin. It is part of one of the largest protected areas in the world. After lunch you'll continue your trip about 20 minutes more and will reach Yacuma River. 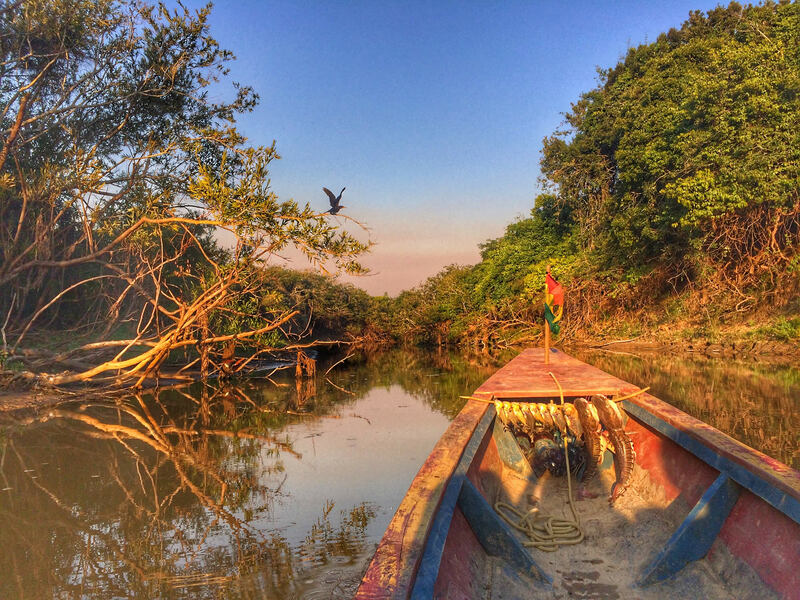 Travelers will take a Boat trip along the Yacuma River. During the 3 to 4 hours of the trip, you will have the opportunity to observe a variety of wildlife such us capibaras, cocodriles, little and big monkeys, turtles, alligators and birds. The Yacuma River is not really wide, so tourists can see the wildlife easily. The boat travels slowly so you can take good pictures. Arrival to the Camp where the cook will welcome you with a soft drink and a snack. In case the weather allows it, you'll be taken to a privileged spot to enjoy a fantastic sunset. Tourists can take some extra money to purchase a beer, soda or chocolates. Boat trip through the swamps. You'll trek around the swamp for about 3 hours looking for Anacondas. During the evening you'll take a boat and swim with the Pink Dolphins. You can also request a piranha fishing activity. Early wake up to enjoy a beautiful pampas sunrise. Return to Rurrenabaque town. The trip will be by boat and later by 4WD jeep as in the beginning of the tour. Arrival in Rurrenabaque town around 16:00 to 17:00 hrs. Due to the road conditions during the rainy season the arrival time to Rurrenabaque town is later. Tourists should leave the luggage that they won't use at the office in Rurrenabaque. A safe deposit box will be provided. Please take into consideration that there is NO ATM in Rurrenabaque town. 2 days - 1 night to 5 days - 4 nights jungle trips. Enjoy the beautiful sunset and sunrise at Pampas and discover the natural wonders inside the Madidi National Park in the Bolivian Amazon basin. This tour will allow you not only to watch native flora and fauna but also to visit the alligators' natural habitat. Travelers are in constant contact with wild animals and have the opportunity to swim with the unique Pink Dolphins. The accommodation at Pampas tour can be arranged in double room cabins or shared room cabins. Cabins feature bathrooms, showers, electricity for 3 to 4 hours during the night. There is a power outlet in the dining room where tourists can recharge their camera batteries. Cabins also feature radio communications. During the search for Anacondas, travelers will be provided with rubber boots to trek around the swamp.